Soulhand wares cater to both novice and expert alike, distilling the complexities of coffee-making into an accessible art form. Our mission is to help everyone make a cup of better coffee anytime anywhere, and more importantly, enjoy the process of making coffee with Soulhand. 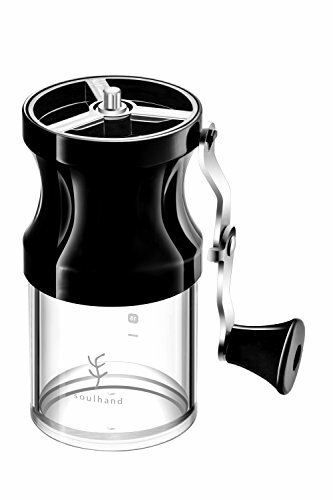 Soulhand Manual Coffee Grinder - Fine or coarse size, full of surprise. Upgraded Foldaway Hand Crank: the handle can be put in the container thus space saving, so that you can carry the handheld grinder around easily wherever you go, whether on your next travel/camping/hiking, or at work. Professional Easy-to-attach handle adapter: reinforced hexagonal adapter for increased grind consistency and good leverage and no worry to lose any components. Adjustable Grind Size: 9 degree settings of grind size (fine or coarse) for you to control over the coarseness of coffee beans for your Pour Over, Ice Drip, Chemex, Cold Brew, French Press, Aeropress, Moka Pot, Turkish, Syphon, etc. FDA Approved Premium Ceramic Conical Burrs: made of industrial ceramic with temperature stability, high wear & corrosion resistance for precise, uniform coffee grinds. Low Heat Ceramic Burrs: With much lower heat created from our manual grinder, the coffee beans retain much more flavor and aroma. Easy to Clean: Soulhand manual coffee grinder is consisted of removable parts, and easy to take apart for cleaning with water. Comes with a cleaning brush for the each part of the coffee bean mill. If you have any questions about this product by soulhand, contact us by completing and submitting the form below. If you are looking for a specif part number, please include it with your message.